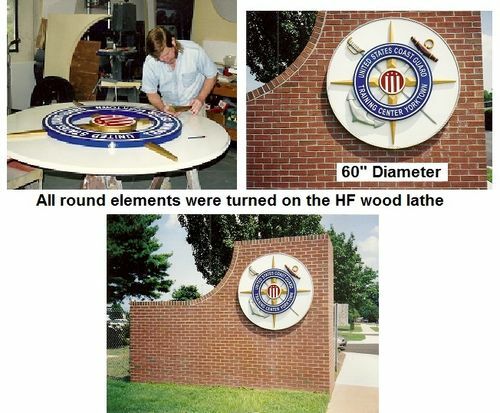 I had the same dilemma several years ago in my sign shop – I wanted to turn some 4ft diameter disks. I found the standard Harbor Freight wood lathe with the head that could pivot to the side or back end. of the pipe. worked like a charm. so then, I could turn a round disk up to 80 inches in diameter. I had that lathe for about 20 years and sold it when I closed my business. last year, I bought another one just like it and am very pleased with that particular model HF wood lathe. I never turned bowls, plates or big burl stock – only round disks to be used in my sign work. 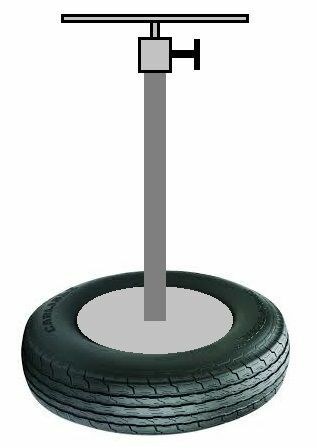 be advised – when you do large work off the center of gravity like that, the stand MUST BE bolted to the floor. sure – there are other models that will do the same thing. I just chose this one because HF was right next door. This information is provided through my personal experience. 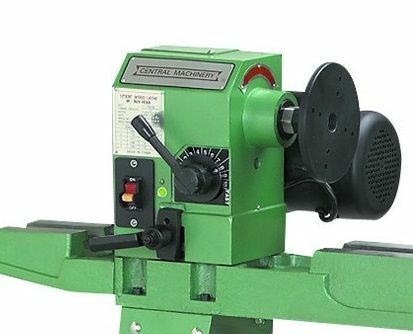 Most lathes allow outboard turning, either by having an outboard spindle on the opposite side of the headstock or by allowing the headstock to be rotated. Very few won’t. sign foam at the time. it is as hard as redwood and basswood without the grain to contend with. Basically, I turned the 2” thick HDU disk with the band on the outside and middle convexed out to the middle. 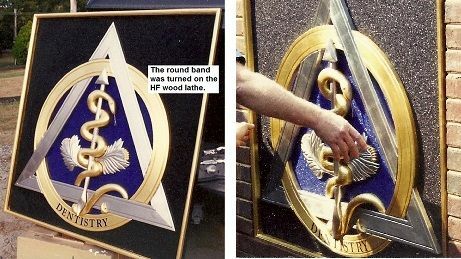 then individual graphic elements were cut out of the same HDU and glued to the disk for the final product. using basic materials and tools and your imagination. I have that same HF lathe #34706 review here. Im impressed you turned something 4ft at the min speed of the lathe about 650rpm – Thats some serious surface speed. I wouldnt try it with wood. I limit myself to a 14” max finish dia due to rpm. The lack of lower rpm is the only limiting factor for the lathe. The Grizzly mentioned has the same problem. I think the grizzly is a 16” swing, the HF is 12”. Other than that, the HF does everything the grizzly will for less than 1/2 the $. It does require a bit more tuning. Depends whether you want to spend time or $. If you can swing the $, variable speed is very nice. Grizzly has one for about $1300 that will probably be my next lathe, G0632. I like it better than the G0766 due to the pivoting head. Its easier to pivot the head vs removing the tail stock and sliding the head to the end, and the tool rest can still be mounted on the bed. the art of large format turning of anything takes a certain amount of skill, knowledge, and nerves. the old timers used to turn round redwood sign disks mounted to the rear wheel rim of a truck !!! 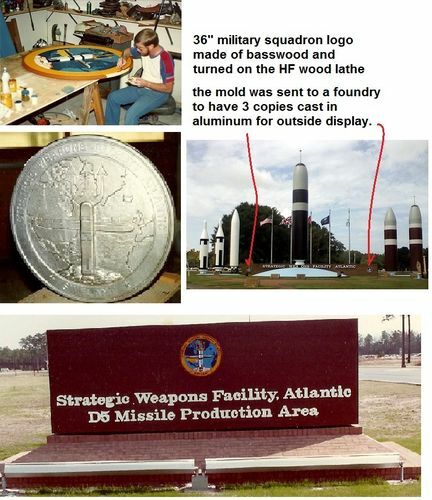 a bit crude – but I have seen photos of it being done – very impressive. IS that an M&M Bowl for Rosie Odonald? John Smith provided very sage advice on bolting an auxilary tool rest to the floor. Not totally sure but think PowerMactic only vendors still selling old style three leg stands. They were notoriously unsafe. Many old lathes offered optional outboard turning with left hand outboard spindle threads. Some offered faceplates free some today offer it as an option. Most old timers used that left hand threaded faceplate as a hand wheel. If did any outboard turning made their own stands. Then came lathes with swiveling head stocks and some provided flimsy auxilary tool rest some offered as an option. Next came the sliding headstocks, can position headstock anywhere along bed or ways. I own one of those and have never moved my headstock after set up. OSUSS, brought out another important safety feature when considering buying a lathe and that’s lathe lowest speed setting! The larger the item to be turned the slower you want to go! Woodturning is inherently dangerous so have to look before leaping! My old lathe starts out at zero and has a low (0 to 1200) and (0 to 3000) high speed range by just my moving belt pulley from to low or high range. Adjust the speed with a dial! Electronic speed control sure make live easier. You can find both old & new lathes offering both inboard & outboard turning. Over the ways (inboard turning) probably the safest because you almost always start off turning bowls with tailstock support! Another important feature want to consider is lathe swing or how big an item can you turn over the ways and tool rest base! Very few buy bowls over bowls over 12 inches! 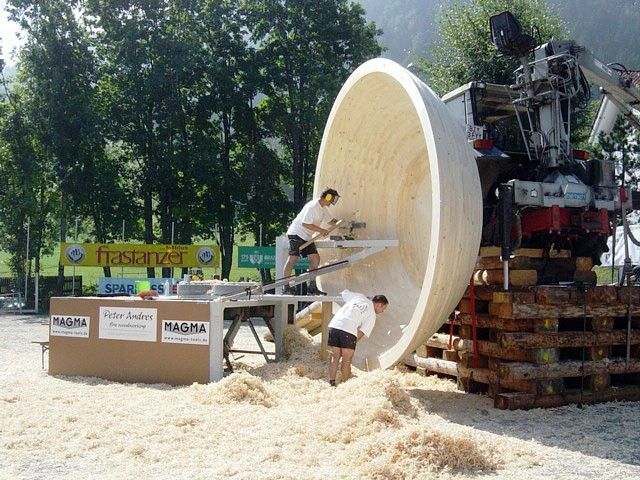 If want to turn really really big items build your own lathe like Moulthrop family and others! Or spend thousands for commercial bowl lathe! I like a pivoting head more for ergonomics than being able to turn large dia stuff. I do not like leaning over the lathe bed to hollow. It is so much easier to hollow with the bowl pivoted to the side. There is no tailstock support (which would be safer) but after hundreds of bowls I’ve only had issues with glue blocks letting go a few times, never had a tenon of parent wood fail and not had one pull out of a chuck or off of a face plate. I also find it easier to sand and finish pieces outboard. 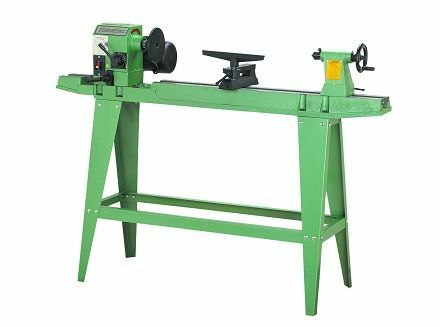 As mentioned these lighter lathes need to be bolted to the floor or weighted. I have a couple hundred pounds of weight on the shelves I added to the frame, and the frame is bolted to a 1-1/2” thick wood slab which is bolted to a mobile base. It will still shake some initially with out of balance material but doesnt walk.